In the neighborhood of Barceloneta is a long narrow standing-room only tapas restaurant called El Vaso de Oro, packed with locals. I arrived straight after yoga, stomache grumbling, credit card in tow. I knew exactly what I wanted to start with: foie a la plancha and a beer. (P.S. This trip is the most beer I've had my entire life). 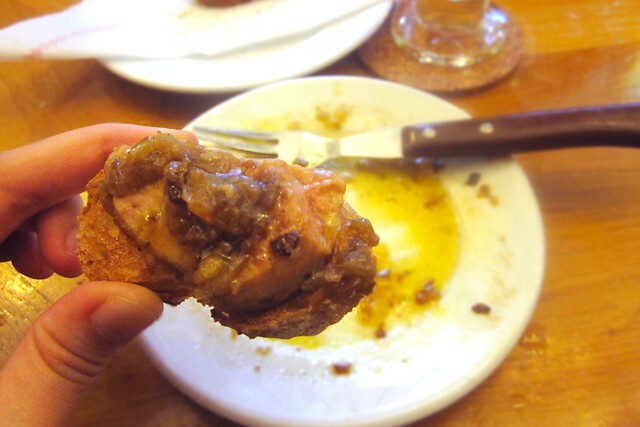 Foie a la plancha is chunks of rich, fattened liver topped with sauteed onions on a fresh piece of toasted bread. I couldnt get enough of the combination melting in my mouth-- I've had foie gras plenty of times, but this was creamier, a little sweeter (could have been the onions), seared to perfection. I wiped down the entire plate of its drippings. As I was about to add onto my order with the waiter, I overheard some customers being rejected from using their credit cards. "Cash only," said the waiter. My jaw dropped, heart sank, face turned beet red. All I had on me was 10 Euros and my credit card. Credit card, not ATM card. I froze in disbelief. And then, the most generous act of kindness was bestowed opon me. Ernesto and Montserrat (childhood friends of each other) who had just placed their orders, complete strangers to me, saw me in my despair, and said something along the lines of, "Join us. We've ordered more than enough to share". Seriously. They were 100% genuine. 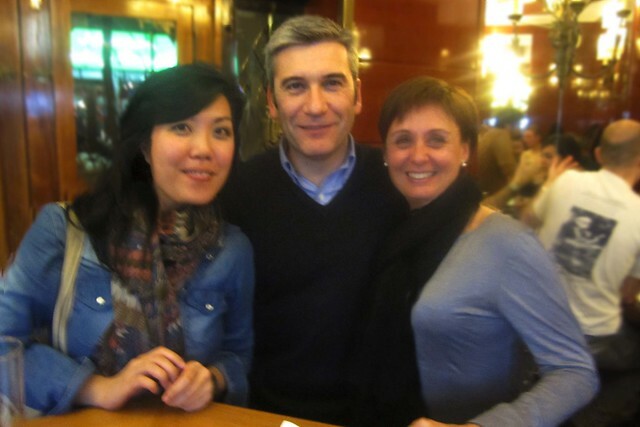 And so, with another round of beer, assortment of tapas, wine and dessert, I became friends with two amazing Catalans. Their overwhelming kindness will always be remembered.